The AES-IP-61 (EIP-61) is IP for accelerating AES-GCM based cryptographic solutions. Designed for easy integration and very high performance the AES-IP-61 crypto accelerator provide a reliable and cost-effective embedded IP solution that is easy to integrate into high-speed processing pipelines. The AES-IP-61 (EIP-61) implements the AES-GCM function with two distinct data paths: one (the AES-IP-61mc) for the AES-CTR cipher mode of the GCM algorithm and one (the AES-IP-61mg) for the GHash mode of the GCM algorithm. The AES-IP-61 is an extreme high performance implementation comprising of 28 parallel AES cipher cores offering performance over 100Gbps @525MHz. 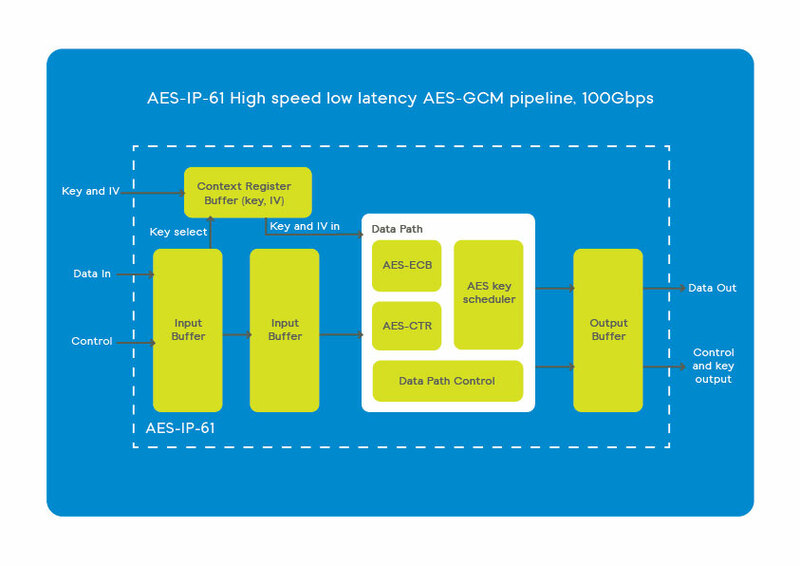 The AES-IP-61 is designed to be the cryptographic accelerator in applications needing raw AES-GCM performance for high speed crypto applications. Sustained performance @525MHz is 134Gbps for the AES-GCM and 119Gpbs for the GHash mode. The area of the cores together is 890K gates.